Whether attacking your favorite break or traveling to far off destinations to chase that perfect wave, the last thing you want to think about is your kite. 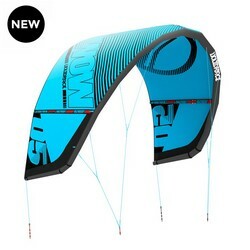 The WOW V3 provides a harmonious relationship between rider and kite that keeps focus on the wave and not on flying the kite. The WOW V3 continues to offer an effortless power band while sheeting, lighting fast bar response, deliberate input back from the kite and extended down the line drift, inspiring confidence in all wave conditions. Improvements this year include a refined bridle schematic that utilizes a flying line design to eliminate unwanted leading edge weight, in addition to increasing depower range which assists in situations ranging from getting over white water walls to scrubbing speed to stay in the critical section of the wave. Fine tweaks in the leading edge to trailing edge profile increased the pivot radius offering precise maneuverability. Though the WOW is our wave weapon don’t let that hold you back from your favorite freeriding pursuits. The same traits that make the WOW the perfect wave magnet also makes carving a slick on a twin tip to flying above the chop on a hydrofoil fun and easy! Who is the WOW V3 for? The wave specialist and strapless freestyle rider that is looking for a no compromise kite that will also unlock limitless freeriding fun.